I briefly considered skipping church this last Sunday. Fr. Rob, our interim rector, was away, so we had Morning Prayer rather than the Eucharist. However Sunday was Easter 3 in Year A. Those of you who have been reading my blog for several years will know what that means. It is the only time in the three year Sunday morning lectionary cycle that we have the Emmaus Road story. This is odd, because Emmaus is found only in Luke, and Year A is the year of Matthew. But it is what the lectionary elves have decreed. The Emmaus story has long been one of my two or three favorite Bible passages. It gained additional meaning when the chaplain chose it as the scripture reading for my grandmother’s funeral in 2006. The only time I have ever opened up a Gideon Bible in a motel was that evening in order to revisit the passage. Each week at church I sit next to this stained glass window. The window lists who it is in memory of and who donated it, but it does not offer a scripture reference. It must, however, be the Emmaus story. I can’t think of any other passage in the Bible that it could represent. Note the figure on the left is a woman. In the passage only one of the two travelers on the road is given a name: Cleopas. The other is left unnamed. Given the norms of first century Near Eastern society this suggests that the other traveler may have been a woman. Of course in that society a woman would only travel with her husband or a close male relative. So perhaps the other traveler was Cleopas’ wife. Often this scene is depicted with two men, so I love that the stained glass artist depicted one of the people as a woman for our window. And I love having this window sitting over my shoulder each Sunday. While it is unlikely that the story is historically true, it is a reminder of Christ’s presence with us. 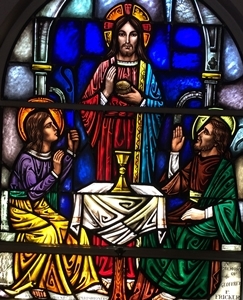 One of my favorite stories too – and I’m sure I told you last time you wrote about it, Rex and I portrayed Cleopas and his wife in a short script that led into communion. Thanks for the reminder. I am glad that Cleopas’ companion is so often portrayed as his wife, even if Luke does not explicitly say that. The lectionary does not give this passage justice.